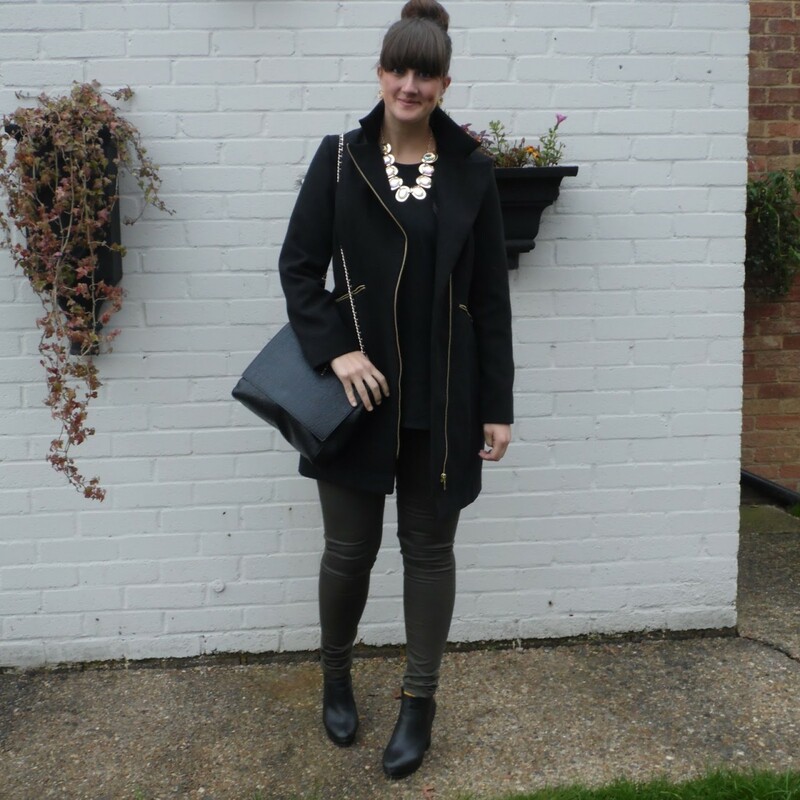 Is there a black coat in your wardrobe? I think you do, as it's extremely versatile cover-up that for sure will make you look fantastic, no matter what is the day, weather, occasion and mood. I personally have two versions of this amazing outerwear, the one with a belt that looks pretty much like a trench and a wrap, slightly oversized version. Anyway, I am here to share with you some of the outstanding ideas of how to wear and style this pretty cool staple. I really hope this compilation will inspire you to buy yourself a brand new coat that will update your outfits. Anyway, let's be modern and think of the best ways of combining your pretty clothes. We see a black zip closure version with leather lapels that is worn atop dark blue knitwear, matte black leggings and edgy booties. With what to wear black coat? I've got over fourty cool ideas for you to choose from. You might think I am crazy, but the most favourable look is total black one, when we dress up totally black. Well, I can't say it's wrong or strange, but it looks elegant. Anyway, you can always go for jeans that are absolute winners with any top, as you can combine them with any kind of outerwear. You can always go for a pencil skirt, A-line or sheath dress. Try eye-catching voluminous scarves, it's a must-have of this season (you have to learn the best ways how to tie it around your neck). If you are in love with classic office looks, then you go for a skirt or pantsuit. The last but not least is the black knee-length boots, you can choose totally classic and elegant ones. Wrap and oversized style looks awesome with crop top and capri leggings. The hooded cape-coat looks very individual styled with knitted sweater-dress, black tights and suede booties. How about wearing a normcore style look? 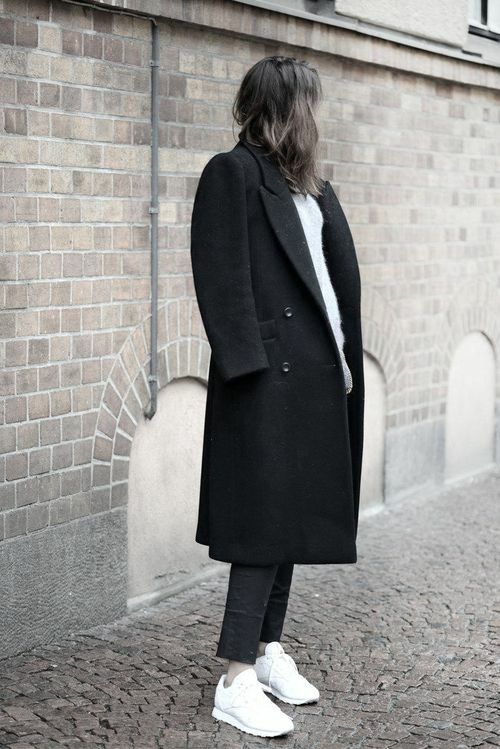 We see an oversized cover-up worn atop cashmere sweater, ankle-length black jeans and white runners. That's a stunning naval inspired look. The tartan oversized scarf looks somewhat grunge inspired to me. The glittering sheath looks awesome with mannish outerwear and red knit beanie. Knee-length black suede boots look awesome with pleated mini skirt. 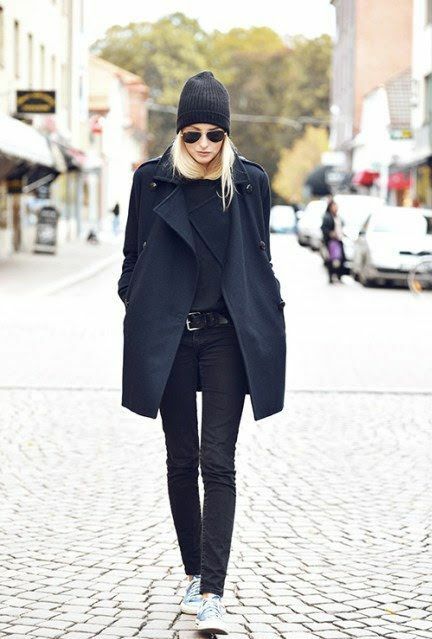 The totally black look can be updated with grey beanie. Go for a sheepskin style and cuffed jeans. 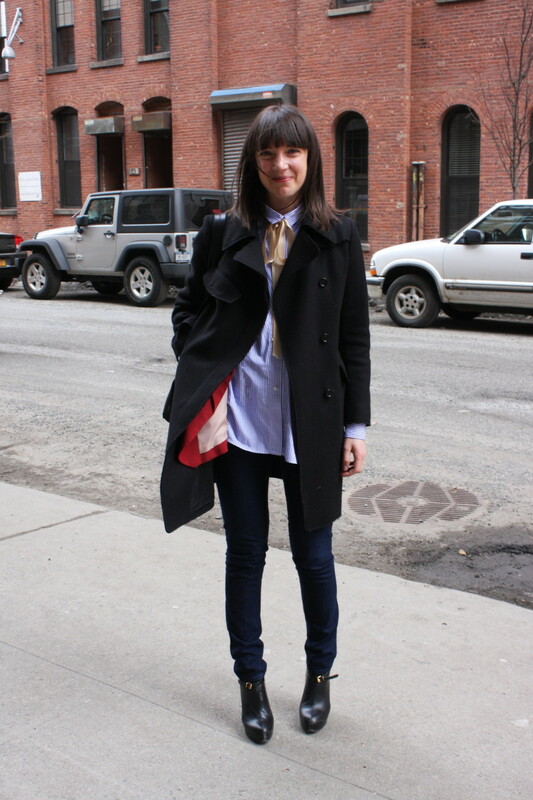 Belted wrap look is another great idea for your street walk. We see uniform inspired black version with statement gold buttons that is worn atop grey top and styled with black leggings. Love the mirrored sunglasses. Wow, that's my favorite! Love the quilted material and flared bottom of this coat. Grunge inspired look is one of my favourites. When it feels like beaing a good girl at the high-school. The slouchy black style is worn atop white tank and teamed with ripped boyfriends. If you are plus size girl, then you shouldn't be afraid of thinking if it suits you or not, as you can go for an oversized cover-up, knitted sweater, ripped jeans and blue sneakers. Red dress and black outerwear is an ideal combination.